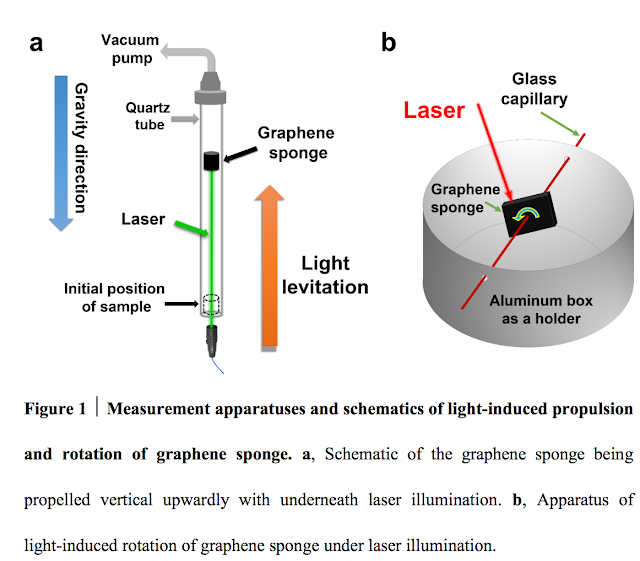 Next Big Future: The direct light propulsion of matter was observed on a macroscopic scale for the first time using a bulk graphene [graphene sponge] based material. The unique structure and properties of graphene and the morphology of the bulk graphene material make it capable of not only absorbing light at various wavelengths but also emitting energetic electrons efficiently enough to drive the bulk material following Newtonian mechanics. Thus, the unique photonic and electronic properties of individual graphene sheets are manifested in the response of the bulk state. These results offer an exciting opportunity to bring about bulk scale light manipulation with the potential to realize long-sought proposals in areas such as the solar sail and space transportation driven directly by sunlight. So the direct radiation pressure induced mechanism can be excluded. Another possibility for explaining our laser-induced propulsion and rotation is the conventional laser beam ablating or burning off of graphene material to generate a plasma plume or carbon particles and molecules for propulsion. But such a mechanism normally needs extremely high laser power supply, so pulsed laser sources (ms/ns level pulse width and gigawatt level peak power) or ultrahigh power continuous wave laser (up to megawatt level) were used. This is contrary to our light-induced motion which can even be observed with sun light which has a much lower power. Note that the continuous wave lasers that we used were only at the Watt level. No ablation could be detected. These results prompt them to search for other possible mechanisms for macroscopic direct light manipulation. It is well known that graphene sheet shows unique optoelectronic properties due to its Dirac conical and gapless band structure, which allows graphene to: 1) absorb all wavelength of light efficiently, 2) achieve population inversion state easily as a result of the excitation of hot electrons and the relaxation bottleneck at the Dirac point and then 3) eject the hot electrons following the Auger-like mechanism. 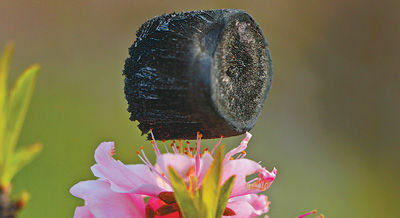 Many studies of this effect have been reported not only for individual suspended graphene sheets but also for reduced graphene oxide sheets. In the competition of different relaxation pathways of carriers at the reverse saturated state of the optically excited graphene, due to the weak electron-phonon coupling, the Auger-like recombination is proved to be the dominant process and plays an unusually strong role in the relaxation dynamics process of the hot carriers (electrons). J s-1 (Watt) could be obtained based the average kinetic energy of 70 eV for the ejected electrons. This is larger than the energy necessary (more than 10^-6 Watt) to vertically propel the sample. Note the actual propulsion force/energy should be significantly larger than the values estimated above, since clearly not all the electrons were collected in the measurement. Thus, this propulsion by Light-Induced Ejected Electrons (LIEE) is actually an energy transfer process, where the photon energy is absorbed by graphene bulk materials and converted into the kinetic energy of ejected electrons, rather than a direct momentum transfer process like in the earlier proposed propulsion by light pressure.